I've got the cutest Fall tutorial for you today! It's an updated version of the Vintage Farmhouse Pumpkin I originally shared THREE years ago. I'm calling these Modern Farmhouse Pumpkins since I did NOT paint the mason jar bands this time allowing the silver to show through. (this gives it more of an "industrial" feel). 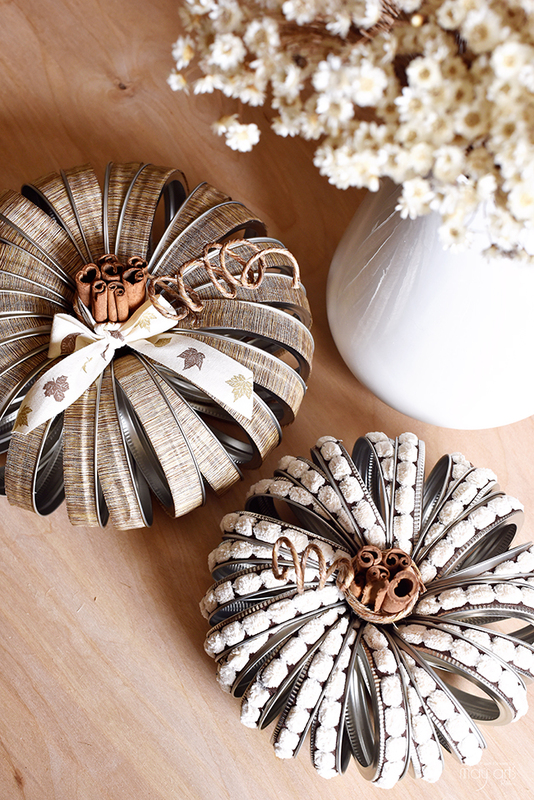 We're also wrapping them in some beautiful May Arts Ribbon instead of vintage paper which really changes the overall vibe of these adorable pumpkins!! 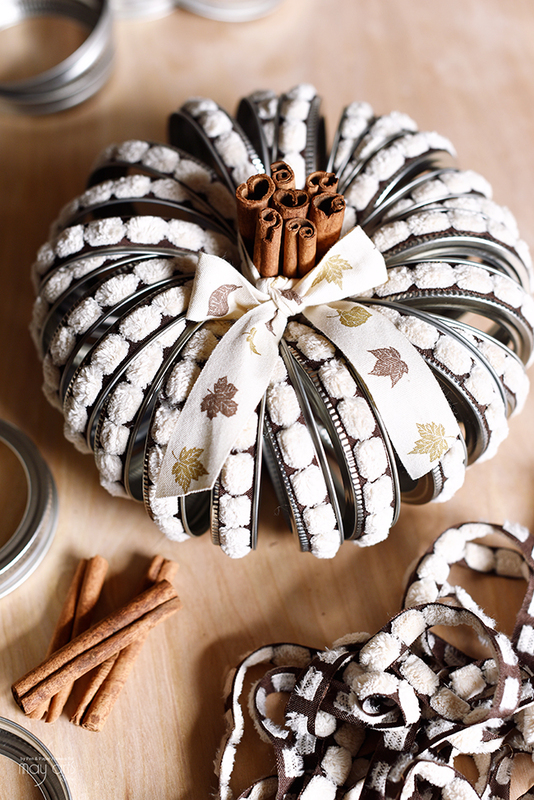 The brown and ivory chenille dot center ribbon I chose to use for one of the pumpkins gives it a little texture and kind of resembles the cotton branches you're seeing all over the place when it comes to farmhouse decorating. The Antique Brown/Gold textured ribbon on the 2nd pumpkin compliments the first one beautifully and makes a lovely pumpkin stem too! I hope you love how these turned out and are inspired to try making one of your own! 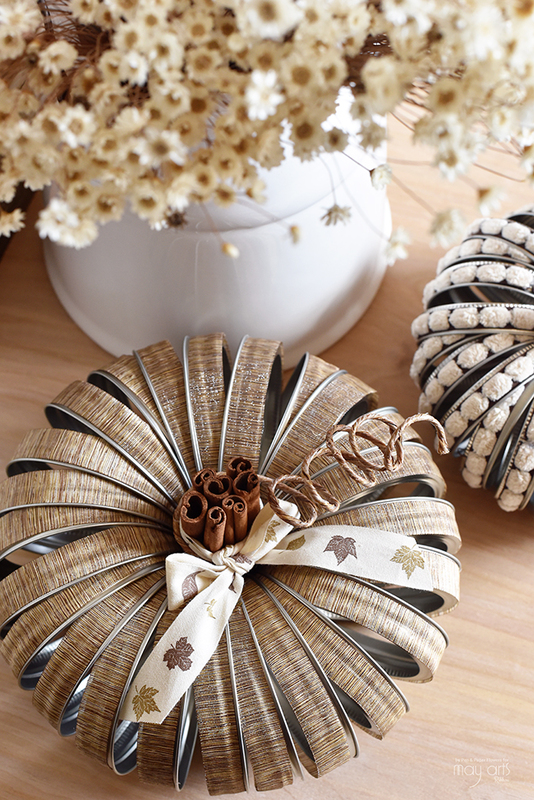 May Arts has a huge selection of pretty ribbons to coordinate with whatever home decor style you gravitate towards but if you love my ribbon selections and would like to duplicate them exactly, I've got the direct links included in the MODERN FARMHOUSE PUMPKIN TUTORIAL over on the May Arts website! THIS IS A SPONSORED POST BY MAY ARTS RIBBON. To be honest, I wasn't sure how much I would love using the ribbon because I'm already so in love with how the the Vintage Farmhouse Pumpkin turned out using paper. Well...I blew my own socks off with the results and I just LOVE when that happens. 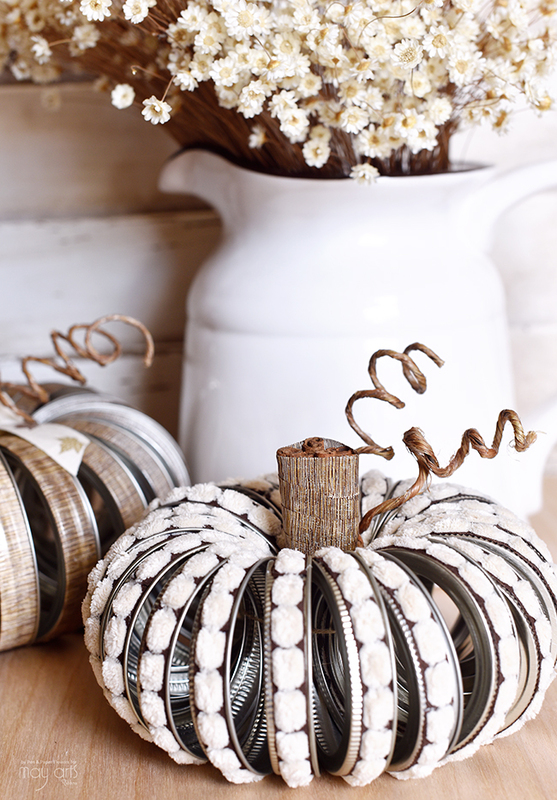 You can bet I'll try one or more of these cute canning ring pumpkins! Love them all and I like the neutrals. Thanks so much for sharing and for especially listing the supplies we need.